This entry was posted in In the News, News & Announcements on May 30, 2018 by Steve Thomas. 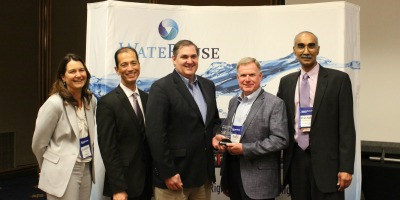 Pure Water Monterey has been honored with the WateReuse Association of California’s Medium Agency of the Year Award. The Monterey Peninsula Water Management District (MPWMD) along with project partner Monterey One Water was presented the award at the Association’s 2018 Annual Conference. 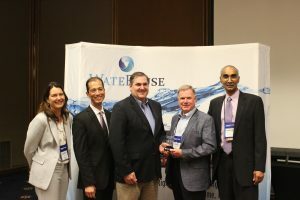 The WateReuse Association is a nationally recognized industry advocacy group that promotes the development and expansion of water reuse, recharge and purification projects in North America. The Medium Agency of the year award recognizes projects and their agencies that produce between 1,000 and 5,000 acre-feet of beneficial reuse per year. The Pure Water Monterey Project will begin delivery of 3.500 acre feet of purified water in mid to late 2019. This entry was posted in In the News, News & Announcements on April 18, 2018 by Steve Thomas. With the realization that additional source waters from the Marina Coast Water District were available to bring into the Advanced Water Purification Facility, the Final Pure Water Monterey Engineering Report has been updated to include the expansion of the current 4 Million Gallon per Day (MGD) plant to a 5 MGD plant. This entry was posted in News & Announcements on November 28, 2017 by Steve Thomas. Presentation from the August 22, 2016 Title 22 public hearing on the Pure Water Monterey Draft Engineering Report. This entry was posted in News & Announcements on August 23, 2016 by Steve Thomas. For the project to begin operations, MRWPCA must obtain a number of permits from the State. One of these is a groundwater replenishment permit issued by the Central Coast Regional Water Quality Control Board (RWQCB) in consultation with the State Water Resources Control Board, Division of Drinking Water (DDW). As part of the process to obtain this RWQCB permit, on January 29, 2016, MWRPCA submitted a draft Engineering Report to DDW for approval and to the RWQCB for review. The draft report provides information about the project and how it complies with public health and water quality regulations. On April 15, 2016, DDW provided comments on the initial draft Engineering Report. MRWPCA revised and submitted a revised draft Engineering Report on May 25, 2016. On July 1, 2016, DDW sent a letter to MRWPCA that stated the Revised Draft Engineering Report was ready for posting for a public hearing with one minor text edit. The Revised Draft Engineering Report, dated July 1, 2016, is available here for viewing. The other steps for issuance of the RWQCB permit include the following activities. MRWPCA will provide updates as the project advances through these steps. Step 1. The DDW and the RWQCB will review the draft Engineering Report and may provide MRWPCA with comments or questions. When the regulatory comments/questions have been resolved to the satisfaction of the regulators, MRWPCA will prepare a final draft report. This step was completed July 1, 2016. Step 2. MRWPCA will hold a public hearing for the project on August 22, 2016 from 2:00 to 3:30 PM. Information on the project is currently available to the public for review 30 days before the hearing, including the hearing notification, information that will be provided at the hearing, and the final draft Engineering report. A public notice was posted in the “Legal Notices” section of the Classifieds (page B5) in the Monterey Herald Newspaper on July 19, 2016 and sent by U.S. Mail to all owners of wells located within the Seaside Groundwater Basin boundary. Public comments will be accepted at the public hearing and during a 10-day public comment period following the hearing. Specifically, comments may be submitted in writing through September 1, 2016 at 5:00 PM. Step 3. Based on comments received during the hearing or comment period, MRWPCA will finalize the Engineering Report for submittal to the DDW and RWQCB. Step 4. The DDW will send a letter to the RWQCB recommending that the RWQCB issue a permit for the project as well as any permit conditions that DDW recommends for inclusion in the permit. Step 5. The RWQCB will issue a tentative permit for public review and comment, and will provide a public comment period of approximately 30 days. The RWQCB will hold a public hearing on the tentative permit for consideration of adoption by its Board. This entry was posted in News & Announcements on July 20, 2016 by PWM. This entry was posted in News & Announcements on July 14, 2016 by PWM. PACIFIC GROVE, Calif.–(BUSINESS WIRE)–Earlier today California American Water president Rob MacLean filed testimony with the California Public Utilities Commission (CPUC) in support of the groundwater replenishment project known as Pure Water Monterey. In his testimony, MacLean said the groundwater replenishment project carries with it potential advantages in terms of schedule and reduced environmental impacts that could make it a preferable option to a larger desalination plant. It is expected the customer bill impacts for the project will be the same or marginally higher than the larger desalination option. MacLean also asked the California Public Utilities Commission to consider the overwhelming support Pure Water Monterey has received from local elected officials. The Monterey Peninsula Water Management District and Monterey Regional Water Pollution Control Agency recently completed the required environmental study for the Pure Water Monterey project. California American Water has also negotiated near-final terms of a water purchase agreement for Pure Water Monterey, which would provide for delivery of 3,500 acre-feet per year of advanced-treated, recycled water to serve as a key component of the future water supply for the Monterey Peninsula. The California Public Utilities Commission is expected to issue its decision on the Monterey Peninsula Water Supply Project, including approval of the Pure Water Monterey purchase agreement, by the end of the year. California American Water’s proposed Monterey Peninsula Water Supply Project consists of a 6.4 million gallon per day seawater desalination facility, water purchased from the Pure Water Monterey project, and expanded underground storage of excess winter river flows. When combined with existing supplies, including groundwater, and 300 acre-feet a year from the Sand City desalination facility, the project will meet the water demands of the Monterey Peninsula community and reduce production from the Carmel River, home to threatened species. The Pure Water Monterey Project will reduce stormwater runoff into the Monterey Bay National Marine Sactuary and reduce discharge to the portions of the Monterey Bay coast designated as Areas of Special Biological Significance. The Monterey Peninsula Water Supply Project is expected to be complete in 2019. Deliveries of water from Pure Water Monterey are expected to begin in July of that year. For more information on the Monterey Peninsula Water Supply project, visit www.watersupplyproject.org. This entry was posted in News & Announcements on January 23, 2016 by Steve Thomas. Monterey, Calif., September 25, 2015 —The Monterey Regional Water Pollution Control Agency (MRWPCA) and the Monterey Peninsula Water Management District (MPWMD) are pleased to jointly announce the release of the Pure Water Monterey Groundwater Replenishment Project’s Final Environmental Impact Report (Final EIR). The MRWPCA Board of Directors will consider certifying the Final EIR and approving the Project at a public hearing on Thursday, October 8, 2015 at 3:30pm. The meeting will be held at the MRWPCA Administrative Office. Pure Water Monterey is a multi-region, multi-benefit project that addresses the water supply needs of the Monterey Peninsula and the Salinas Valley. The project will deliver purified recycled water for replenishment of the Seaside Groundwater Basin and subsequent delivery to Monterey Peninsula urban water customers, and also deliver additional tertiary treated water to the Salinas Valley for agricultural irrigation and to help reduce groundwater pumping in that area. The Final EIR can be found at www.purewatermonterey.org. The Draft EIR was released to the public in April of this year and provided the required 45-day review period for comment. The Final EIR addresses the comments received on the Draft EIR and also contains revisions, updates and clarifications to the Draft EIR in response to the public comments. Additional information can be found in the official Notice of Public Hearing which can also be accessed on the Pure Water Monterey website. Spanish interpretation will be provided at the hearing. Pure Water Monterey will provide both purified potable water for domestic use, as well as a supply for irrigating one of the state’s most fertile agricultural areas in the Salinas Valley. The project will be the first of its kind to utilize not just wastewater, but stormwater, food industry processing water, and impaired surface waters of the State. It is a partnership between the Monterey Peninsula Water Management District and the Monterey Regional Water Pollution Control Agency with additional project participation by the Monterey County Water Resources Agency, the City of Salinas, the Marina Coast Water District and the Salinas Valley Agricultural Community. This entry was posted in News & Announcements on September 25, 2015 by PWM. Monterey, Calif., April 22, 2015 — The Monterey Peninsula Water Management District (MPWMD) and the Monterey Regional Water Pollution Control Agency (MRWPCA) are proud to jointly announce the release of the Pure Water Monterey Groundwater Replenishment Project Draft Environmental Impact Report (DEIR). Pure Water Monterey is a multi-region, multi-benefit project that addresses the water supply needs of the Monterey Peninsula and the Salinas Valley by not only delivering highly purified water for replenishment of the Seaside Groundwater Basin, but also delivering additional tertiary treated water to the Salinas Valley for agricultural irrigation, thereby reducing groundwater pumping in that area. The DEIR can be found at www.purewatermonterey.org and the public is encouraged to review and comment on the document during the established 45-day period that opens today and closes on June 5, 2015 at 5pm. These comments will then be addressed in the Final EIR. The public is also invited to two separate public information meetings. There, attendees will have the opportunity to learn more about the project during a presentation followed by a question and answer period where the project’s DEIR will be discussed. Spanish translation will be provided at each ADA accessible location. When faxing comments, please also email or send a physical copy of the correspondence to the above address to ensure receipt. Pure Water Monterey is a multi-region, multi-benefit advanced water purification project that will recycle and deliver highly treated waste, storm, agricultural and impaired waters to the residents, businesses and agricultural interests of Monterey County. It is a partnership between the Monterey Peninsula Water Management District and the Monterey Regional Water Pollution Control Agency with additional project participation by the Monterey County Water Resources Agency, the City of Salinas, the Marina Coast Water District and the Salinas Valley Agricultural Community. This entry was posted in News & Announcements on April 22, 2015 by PWM. Draft Environmental Impact Report (Draft EIR) is available here. Also see Notice of Availability for various ways to access.